Well, I’ve finished my 7th marathon, and although it was certainly not my fastest time ever, for other reasons, it was probably the best marathon I’ve ever done. It was an early start: 7:10am, but everything went pretty smoothly in the morning before the race. There were something like 1,500 full marathon runners and 3,500 half-marathon runners, but the starts were staggered (half marathoners began at 7:20), so it wasn’t even that congested during the first couple of miles. 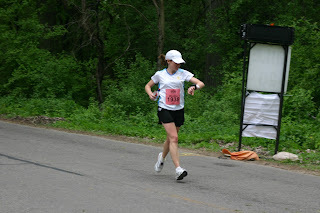 As with my last umpteen marathons, I wore a 3:45 pace band (listing the mile splits for a 3:45 marathon). The pace per mile for this is around 8 minutes 34 seconds. I hit mile 1 at 8:07, so it was a bit of a fast start. This can spell disaster for a marathon (the worst thing you can do is start out too fast), so I tried my best to slow it down, but could only manage to pull it back to around 8:25’s. Too much adrenaline I guess. Rob had taken his bike and was riding around the course to cheer me on at different points. He was wearing an almost neon-yellow shirt, so it was pretty easy for me to spot him along the side of the road. The spectators at this race were really great. 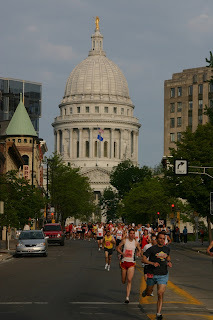 After the start at the capitol building, the first several miles were downtown and then through some residential areas. There were a fair amount of spectators who were really exuberant at cheering, which is probably another reason why I kept going too fast. The race numbers also had been printed with your name on it, so the whole way, people were shouting, “Go Melissa!” which was pretty neat. There were some hills though. It was gently rolling at first, which actually felt kind of nice, but then there were a few fairly sizable ones around miles 8-10. It took a lot out of me to power up those hills. Plus, it was windy. My quads already hurt, which was a bad sign, but I had to keep telling myself not to freak out about it. One thing that I was doing pretty well was taking in fluid and electrolytes. I grabbed Gatorade and water at every water station. Sometimes my body just refuses Gatorade during marathons—this is definitely what happened during the last one in Springfield, MO. A couple of times today I just couldn’t choke down the Gatorade, but overall I was having a much better time with it than in Springfield. I also started forcing myself to take a Mango-flavored Clif Shot at mile 7. These are slime-like electrolyte packets. Mile 7 is about as long as you dare wait to start taking this during a marathon. I don’t think I actually took any in Springfield, which is another reason why I’d suffered so much. So today, even though the thought of goo was repugnant, I started slurping it down, little by little. I actually slurped on the 100-calorie packet for about 7 miles, but at least I got it down. Shortly after a big hill around mile 9, there was a guy on the side of the road handing out beer. I know we were in Wisconsin and all, but still, I declined. At some point around here there was also a guy handing out small bottles of water (8 oz); I’m not sure if that was part an official aid station, or if he was just a nice guy, but I did take one of those. I ended up carrying that little bottle with me for most of the rest of the race; it actually was a huge help to keep sipping on water during those stretches between aid stations. From about mile 11-13, we ran along a tree-lined, crushed gravel path next to Lake Mendota. It was so beautiful, and the crushed gravel was much nicer to the legs than concrete or asphalt. But there were no spectators again until about mile 15 or 16. Despite the beauty, it was a bit grim and windy, and these actually ended up being the hardest miles of the marathon for me. My pace dropped off dramatically, but since I’d banked so much time early on (actually, a marathoning cardinal sin), I stayed on pace for a 3:45 until about mile 18. I didn’t see Rob for 5 or 6 miles during this grim part (he’d wisely opted not to bike along the narrow gravel path and be in everybody’s way). When he was able to see me again, he told me that’d he’d felt bad that he couldn’t be at the halfway point (mile 13.1) to sing Living on a Prayer to me in a Scottish accent. He made up for it by singing to me then and there, even though I was well past the half. He also played The Final Countdown for me from his iPhone. Both of these things were hugely motivating. My legs hurt and I was tired, but the amazing thing was, I didn’t feel terrible. I kept forcing myself to take little slurps of electrolyte goo and sips of water from the little bottle I refused to relinquish. And it was a good strategy. I never hit the wall. I never had to bargain with various deities to stay alive. 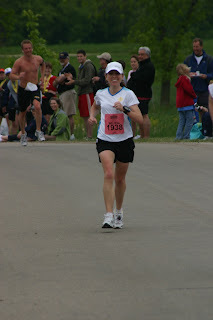 In fact, I was laughing and talking with Rob or other runners; I had enough energy, just not enough leg power. The first 10 miles had toasted my quads. Miles 16-21 were through a golf course and the UW-Madison Arboretum. It was mainly tree-lined: pretty and very green but not a whole lot of spectators. I caught myself scanning the trees for howler monkeys (that’s generally a bad sign), but since I didn’t see any, I guess that meant I hadn’t completely lost it. During this time, we were on a road rather than a thin dirt path, so Rob actually stayed nearby most of this time. I didn’t realize until I hit mile 20 that I had fallen off 3:45 pace. I just rolled with it though. Feeling this alive so far into a marathon made up for the disappointment. Besides, I thought, anything could happen. Since I was feeling so good, I tried my best to speed up over the last 6 miles. But there were more hills and wind that got to me, so I’m not sure if my efforts really panned out. It got a little tough for the last few miles, but I just thought about Eduardo and kept going. At about 25.5, the 3:50 pace group caught me. 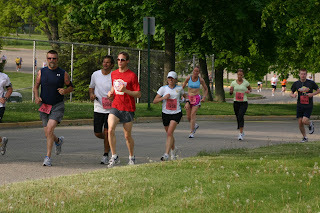 (A group of runners led by an experienced pacer who’s leading them to a certain time). “All right, Auntie M!” The pace leader shouted. 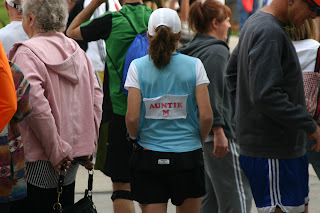 He said they had been following me all day, seeing the pink “Auntie M” I had written on the back of my shirt. He said he was about 20 seconds up, so to just stay with him and I’d finish in 3:49:40 or so. I tried, but he went on past. I hung on to the tail end of the pace group though. We finally rounded the corner and suddenly I saw the finish line up ahead and people cheering on the side. My sister and Mark and Logan were among them, but somehow I missed them in the commotion. The big clock at the finish line had already turned to 3:50, and I ran with all my might towards the end. People were cheering wildly; I saw Rob in his bright yellow shirt standing on the sideline. At last I ran across the finish line and was done. My official time was 3:50:18. For the moment, I was too happy to be finished running to be sad about being 5 minutes behind my goal. Full speed ahead to the finish. My sister said as I rounded the corner amidst the other runners, she recognized me by my shining, white teeth. It was probably just about the best marathon I’ve done so far. Most of the course was really beautiful, and there were a lot of spectators to cheer you on. I never walked, not even one step, the whole time. I never felt terrible; there was no “wall.” Even in my fastest marathon, I had a couple of horrendous sobbing miles somewhere in the 10:40 or 11:00 range. I’m not sure mathematically how this can work out, but this time, I don’t think I had a mile slower than 9:36. I guess I just started slowing down early on, from the hills and the wind. But it was a good effort. I’m a little disappointed at myself, but really, I did the best I could and mainly I’m just happy that I didn’t end up falling apart. Its the only marathon I’ve ever run where I haven’t at some point, vowed to never run again. I’m already trying to decide which one is next. 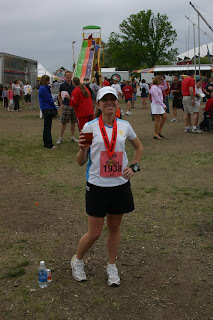 It wouldn't be a Wisconsin marathon if there wasn't a beer at the end. That’s enough for now. Thanks for reading. You swore by that Glisten. I have trouble with the Gatorade too, so what I did is grab a water and a Gatorade at every stop, pour one into the other to dilute, and drink. Worked like a charm! WOW!!! What a great race 'report' -- i've been waiting for the one where you actually enjoyed yourself while completing such a huge 'accomplishment' -- and you know how important those 'accomplishments' are in our family tree!!! ha Thanks to you and Rob, we all got to be part of it ... and so happy that MM&L were there to cheer you across the finish line!!! Hey, Melissa, thanks for the blog entry--I really enjoyed it! And congratulations on a great race. By 'great' I mean what you did with it while it was happening--not getting stuck in your desired results. Thanks for the inspiration, too. This year I ran the half, and I'm working toward a full! Nice job! You certainly seem in far better spirits after this one than usual, so I would say that's far better than getting a specific time. Congrats on a great run! You're right...that smile is the best part of the finishing chute. I had a great finish also. 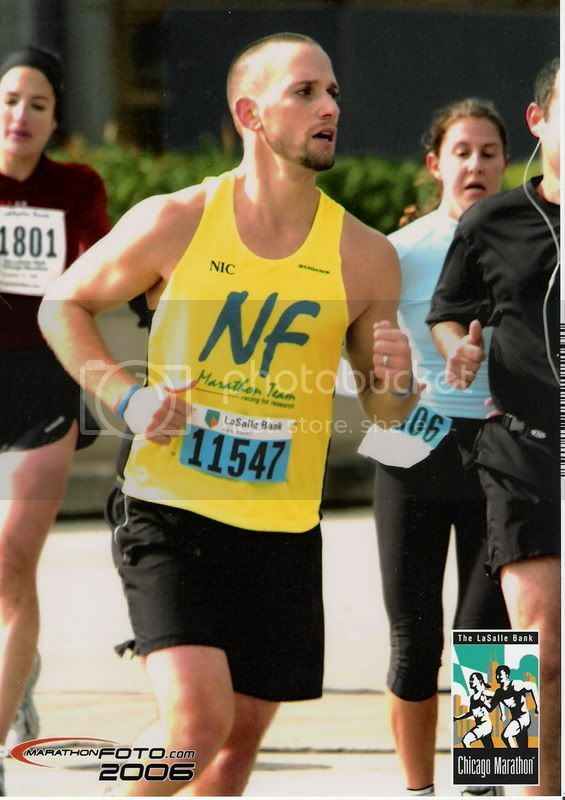 What an amazing city to run in, and you have some great pictures there too!